When we don’t understand deeply about impermanence, we shouldn’t think too much. We try to be aware and learn first. Allow the understanding to come and not think about what you already know [yogi's note: intellectually] all the time. They don’t really understand; just understand at the intellectual level. They think it’s impermanent, but the mind has a lot of defilements; craving wants to be permanent. Later when craving can’t get what it wants, it becomes depressed. You always think about Dukkha but don’t really understand Dukkha. Craving doesn’t want suffering; hence over a long time, there is conflict. Anatta means you cannot control anything, you cannot own anything, but the mind wants to own, craving wants to own. So, over a long time, you become depressed. Why? It is because understanding cannot match up to defilements. They try to contemplate this but understanding is not enough and craving is very strong. So, over a long time, there is conflict and they become depressed. Everybody has ego; ego is strong in everybody, no less in you. Try to be aware of what happens to your quality of your mind when there is ego. Try to continue to be aware, and then slowly the mind will find a way. Keep going. That’s enough. When the idea of ‘self’ arises, how do you feel, what does the mind think and how do you act; everything. At that time, the way the mind thinks and what ideas it has; how do you feel and everything; that is watching and learning. The mind makes up a story and wants to think about the story to feel satisfied. It tries to cheat you. That’s why we do not believe the deluded mind. If you’re aware, slowly, the mind doesn’t believe what it is thinking and doing; then, it cannot grow, it cannot overwhelm you, it cannot eat you. Otherwise, the defilement eats the whole mind. Try to watch again and again. That’s it; like somebody comes to cheat you. You know he’s coming to cheat you and you just look at him. Every time he comes to cheat you, you just look at him. Later, he goes away. Because he can cheat you, that’s why he comes again and again. Yogi: We say “These are just thoughts, feelings and conditions”, but the mind still thinks that there is an ‘I’. Sayadaw: Yes, that is why we need to discover the proof of this understanding and show the mind that this is nature by observing. So, it is not enough to just do the initial ‘This is nature’. After that you need to watch continuously. We are not supposed to believe that this is nature; that’s just to help us watch. You remind yourself and you watch continuously; that is why you do the yogi’s job, which is ‘this is nature, be aware and be aware continuously’. All our wrong views are very strong. We are watching all these things to the point when the mind is calm and clear; then there is a chance for right view to arise naturally. We are watching so that when the mind is clear and awareness is still present, wisdom can come in at that time. Yogi: Even if you are aware of the process of thinking, it still seems difficult to dissociate the sense of self from it. Sayadaw: There is no need to dissociate because it is all about knowing what is happening in the present moment, as it is. So you know there is thinking, and you know the sense of "I." Know that as well, recognize both. Because you are aware you are on top of both. That's fine. The benefit of that is that when sometimes the sense of "I" is not present, you then recognize it so clearly, because you have been recognizing it when it is there. Yogi: Creating and cultivating one’s identity feels delusional. Sayadaw: When you recognise it, then there is no delusion because you see it for what it is doing, you see the mind. Because after all conceptualising is something we need to do in order to survive in the conceptual world, but when it is known then it is not delusion. You need to think that every experience is nature, not personal. And you need to be interested in this nature. Some nature is pleasant and some nature is unpleasant. If you identify with the experience as ‘me’ then the pleasant and unpleasant feelings increase because of the idea of self. When the idea of self is involved, then the defilements become stronger and stronger. When pleasant experience comes, people become happy and are attached to the pleasant experience. People are afraid of bad experiences; they don’t want to look at unpleasant experiences. The aim of meditation is to try to understand. We are not trying to be involved with either pleasant or unpleasant experiences. So, we need to learn about both pleasant and unpleasant experiences. Without identifying, without taking them personally, you can learn from both these experiences. Yogi: Talking brings up the idea of self really quickly. Complete ignorance; we don’t know anything about something. And between concept and reality – what we know are concepts and we believe concepts are real but they are not – believing in what is not real (concepts) to be real and what is real [reality] to not exist [yogi's note: for example, we are seeing all the time but we don’t recognize that we are seeing] is the worst delusion. Yogi: In daily life we have to do a lot of things; so if we try to be aware all the time, what else can we do in our life? Sayadaw: If you try to be aware when talking or doing something, the quality of your mind is very different. Doing anything with awareness, your mind quality becomes better and better. The mind quality is totally different from when you don’t have awareness. If you are not aware, the mind is deluded; and when there is delusion, any defilement can arise. For example, you can become angry fast and talk back without thinking – then a lot of problems arise. If there is awareness, you know that the mind is angry. You don’t talk yet; you then have the space to think what to do – to talk or not to talk. Then wisdom is involved to decide whether you should or should not talk; and then the quality of mind becomes different, very different. Any time your mental action, verbal action and physical action have awareness and wisdom, you are secure. Everything is smooth because problems are motivated by craving, aversion and delusion. Because of the defilements you then suffer all the time, right? I know many yogis want to meditate, they really want to meditate. But they don’t want to meditate all the time. This is real – that’s why they cannot improve. Long time, many years they cannot improve because they don’t want to meditate continuously, but they sincerely want to meditate. In the beginning, yogis try to learn how to watch lobha and dosa, lobha and dosa, lobha and dosa. And slowly we know why it is happening; slowly we understand that dosa arises because of lobha. Then we continue on learning. We understand that lobha arises because we don’t know the right things. That’s why the mind becomes attached. Later, when the mind understands more and more, we can see moha working. If you have moha, you have the wrong ideas. And later we can change the wrong ideas to right ideas – that’s all to it. In the beginning, we try to watch lobha and dosa, lobha and dosa. Later, we go directly to watch moha. Then lobha and dosa will not happen anymore. Say a physical sensation. You know the physical sensation, that’s clear. As you watch the physical sensation, you can do the same thing with the feeling that comes with being worried. You can watch it in the same way. A new yogi questioned if the practice was truly the way to purify the mind because all she saw were defilements and suffering. She was used to getting calm and peace in samatha practice. But when told to watch the mind, she saw all those suffering. TS: Yes, indeed this is the way to purify the mind because what are being observed – the defilements and suffering – are not what the purification is about. The process of purification is happening through the watching. It’s the watching that you want to cultivate. She was noticing the objects/experiences that were coming, but she didn’t notice the observing mind. You can see the mind experiencing suffering, but at the same time the mind can still watch in equanimity. Wandering mind. You need to practice noticing thinking whenever the mind is thinking and then go back to body sensations or any physical object back and forth, again and again. Later when thinking arises, awareness arises too because the mind understands that thinking is an object. That’s why the mind is not involved in the thinking process. Angry thoughts. Watch and learn how much the mind suffers; then naturally you will let go. Be patient. When your understanding deepens, the mind naturally becomes more peaceful; it will notice that although the object is suffering, the watching mind is equanimous. Random thoughts. Whatever thoughts arise during meditation, just notice them; that’s enough. There’s nothing to do. We are trying to be aware; we are not trying to do anything about thoughts (the experience/objects). Let it be. Additive thinking – limit thinking to present moment experience, e.g. what is the mind doing and then what happens? Investigative thinking should wake up wisdom and make the mind more interested in the object. Meaningless thoughts – Notice the useless thoughts repeatedly whenever they appear. Because of defilements, meaningless thinking appears. When wisdom is stronger, then useless thinking naturally decreases. I started meditating at an early age, but I still suffered from periods of depression 3 times because my practice was not continuous. Then, I didn’t practice all the time – on-off, on-off, and on-off; and the defilements came back. 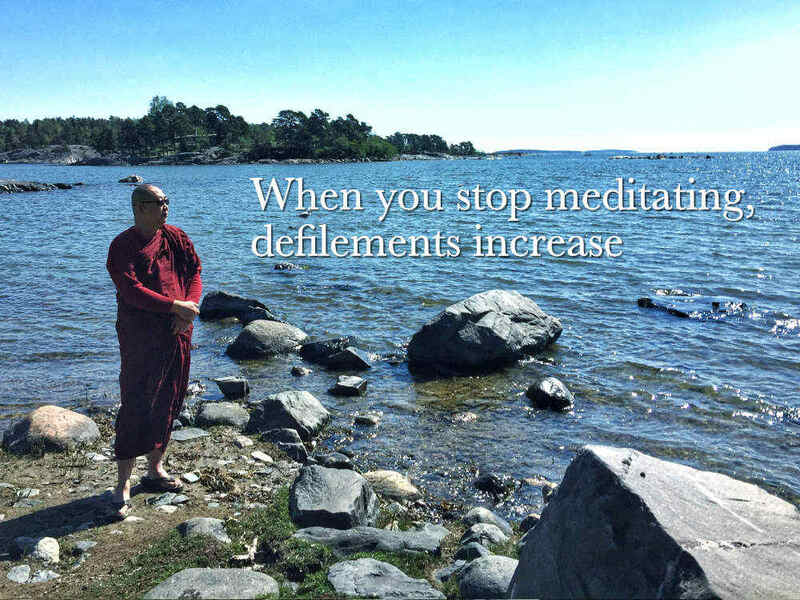 When you stop meditating, defilements increase and overwhelm again because understanding is not enough. After 3 times of depression, I realized that meditation should never stop. One time, I continued practicing 8 months to a year, it was very good. After that, slowly, the meditation became less and less; then, defilements overwhelmed again. After 3 times, I realized that meditation should never stop. A numb mind is a deluded mind, that’s it. And you need to appreciate that you’re aware of the numb mind. A deluded mind is such; it doesn’t know anything and doesn’t want to do anything, just blur, blur. But if you notice it, it’s okay. It is said that the mind energy of old people becomes weaker and weaker. I say ‘No’. It becomes stronger and stronger, but it is all deluded. Good quality is weaker and weaker, and bad quality is increasing. When people are old, they have a lot more delusion. Delusion totally overwhelms the mind of old people. Because they never practice to increase the good quality of mind, naturally, delusion must be increasing.